I haven't done a WIP post for ages. I've got into a bad habit where the only thing I seem to be posting about are finished objects. This blog was never meant to be a simple catalogue of FOs. I wanted to share my ups and downs and thought processes, but I think I've been sharing most of that on my podcast or posting on Instagram for a quick "here's what I'm working on right now" photo and explanation. I think in order to get round these omissions I might try and set up a way of posting those update photos from Instagram to the blog. I will try it as an experiment for a week or so and then decide if it is working or not. These updates will be titled as Instagram posts, so please let me know if you find the posts helpful, interesting or a pain in the neck. In the meantime here are some updates on what I'm currently working on. These vanilla socks are being knit out of some of my favourite sock yarn, which is from Knitters Nightmare. Sadie's Boogieman Sock is a wonderfully smooth and soft sock yarn that is strong as well. The yarn is 75% merino and 25% nylon and the colourway is Seashore, and yes the colours really are that vibrant! I love knitting these socks and I can't wait to get them on my feet. I just realised that I haven't shared with you a pair of socks that I finished a couple of weeks ago. I do tend to knit them quite quickly these days and they get lost in the rush. These socks are rather splendid though so I want to share them with you. I know I have a bit of a tendency towards to knitting rather bright socks but after the success of these more neutral socks, I decided I wanted to try some more muted yarns. I picked up some ordinary Regia yarn so I can throw the socks in the washing machine. I don't have many pairs of machine washable socks using my new personalised vanilla sock pattern so it seemed sensible to knock up a couple of pairs. Regia is such a great workhorse yarn. These socks will be worn for years. The yarn is Regia Design Line Ombre Stripe in colourway 04480. 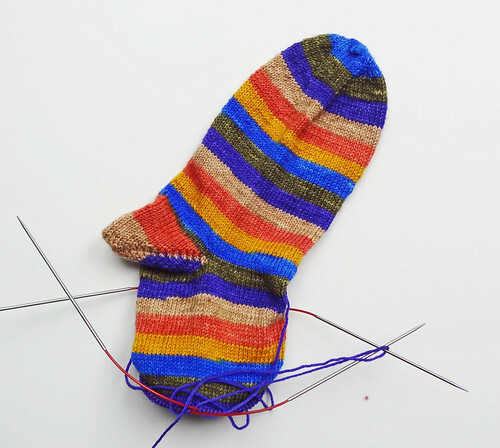 I really like how this muted stripe looks and it's a nice contrast to the Knitters Nightmare socks that are so vibrant. Sometimes it's nice to knit soothing stocking stitch in a nice soft colour. It's calming! In contrast to all the soothing stocking stitch I have a couple of interesting projects that I need to concentrate a bit for. The first is the Simene Stole, by Melanie Edgar, from The Scrumptious Collection Volume 3 that I reviewed in January. I'm using Fyberspates Scrumptious Lace in the Teal colourway. It's gorgeous stuff and the pattern is pretty straight forward, for a lace pattern. I've got as far as midway through the 7th chart repeat, in the first half of the stole. There are only meant to be 6 repeats but I wanted to use up as much of the yarn as possible, and also ensure that the stole could be properly wrapped around my ample frame! When I've finished the 7th repeat I'll weigh the skein and measure the worked part and see if I think I can squeeze in another repeat without running out of yarn or making it into a Doctor Who scarf rather than a stole! The other "thinking" project is knit using cables. The pattern is from Coopknits Toasty Vol 1 by Rachel Coopey. I really enjoyed her work in the Fyberspates Scrumptious Collection Volume 3 book and decided that as I enjoyed her writing style and her design aesthetic I would buy this book, and it's worth every penny of it's £12.00 price tag, especially as you get a digital download code for the patterns on Ravelry included in the price of the hard copy. The pattern I decided to start with, from this book, is Ripon. It's a lovely slouchy hat knit in 4 ply and covered with cables. What more could a girl, who loves hats, want? The pattern is written to use Titus 4 Ply but I wanted a hat to match the new stole I am making, plus my new turquoise handbag. I decided to use Jamieson & Smith 2 Ply Jumper Weight Yarn in the Very Bright Turquoise (132) colourway. I haven't got very far, but I am enjoying it immensely. I hope to get this hat finished by the end of June 2014 as that is the deadline for entry into the Island KAL being run by Sarah of the Fiber Trek podcast. 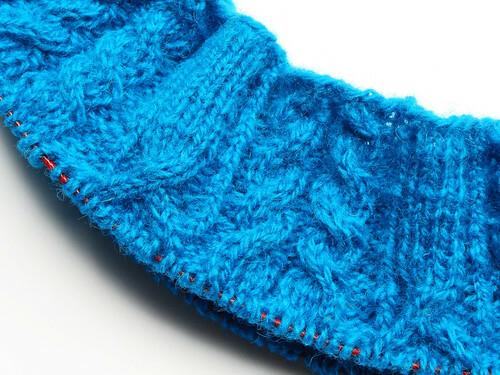 The project uses Shetland wool, which means it is eligible for the KAL, as it is an island produced yarn. 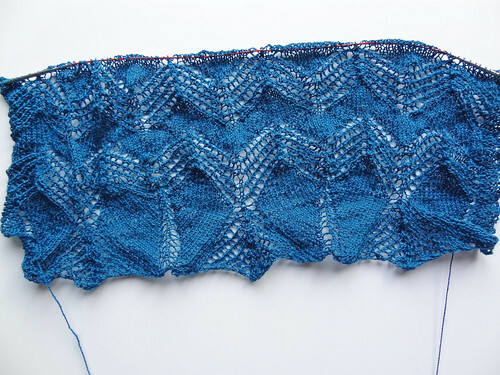 It's a fun idea for a KAL and it's nice to do some cabling work again. So those are most of my currently active knitting projects. It's nice to take stock occasionally and share my progress. I will try and do more update posts again, I do miss it. Hopefully the Instagram posts will help fill the gaps that I leave, but please let me know what you think of that idea, both in theory and reality!